Home » New Release » Hobby Lobby is now Hobby Express! This all-new version is covered in genuine Oracover, has built in flaps, quality construction and hardware, and even comes with a camera mounting cover. With the flaps down it will almost hover in a 10MPH wind. See it in action! 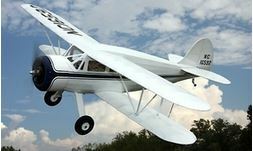 For the club or individual who wants a huge airplane that can carry cameras, drop parachute guys or candy, fly incredibly slowly and still be transported in a regular car – the 12 Foot Telemaster ARF is it. Check it out! 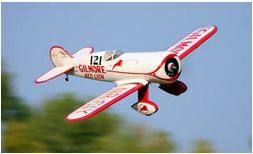 Pilot-1 Gilmore Red Lion 1/4 Scale ARF Authentic 1/4 scale racing classic for electric or gas.The Pilot-1 Gilmore Red Lion is a true to scale rendition of this famous 30s racer.The outlines are correct with only a minor increase in vertical tail area.The wing is the correct shape and in the right location requiring a notch in the lower part of the massive cowl. 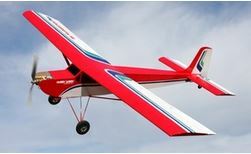 Whether built as an electric or gas model the flight performance is a total joy, take offs are short and climb performance is quick. 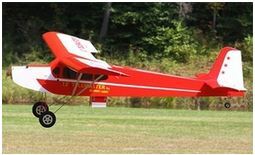 The airplane will slip into a small field just like the original full scale one did. 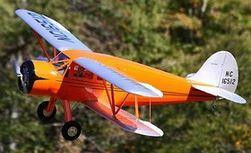 Much simpler to assemble than many biplanes, the Waco’s upper wing attaches to the side on the fuselage and is automatically aligned. Assembly will take 6-8 hours, the illustrated instructions provide clear guidance.